My nephew, Asher, recently turned 3 and I was assigned the super fun task of making his birthday cake or cupcakes (I was given the choice). 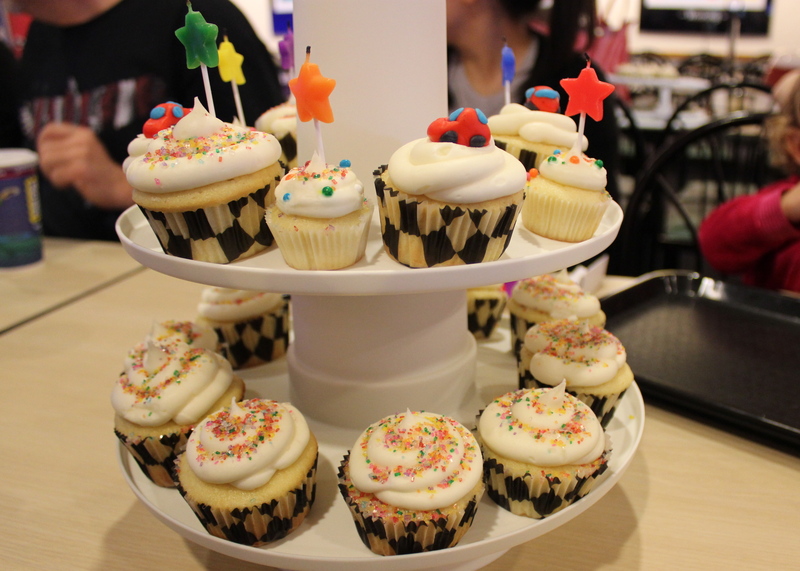 We had his party at a venue, so I decided cupcakes were the easier, more practical choice. The flavors I chose for this event were a basic vanilla for the batter, using the two-step method which worked great, and a delicious vanilla/cream cheese icing that was a great hit. Scooping the batter into the liners with an ice cream scoop for the first time, left me with just enough batter to make a few mini cupcakes. I chose a cars theme for his cupcakes. He loves cars. He LOVES “VW Bugs”. So I got the idea to work with fondant on cupcakes for the first time, and hand molded a red Lightening McQueen type car, a VW Bug (of COURSE! ), a VW Bug Bus, and a truck (that’s as close to Mater as I dared to get). The most challenging part of working with fondant, was coloring it. I chose a basic white fondant, and decided to use gel coloring to color it. It looked so easy in the tutorial videos, but you know what they say. “Looks can be deceiving”. Needless to say, I’m just going to paint the fondant next time. Making white fondant into bright red and black, was way too time consuming. And my hands were all sorts of colors for the next 2 days. A problem I realize could have been easily prevented with latex gloves. Live and learn. Love hims. Happy 3rd Birthday, Asher! For my father-in-laws 60th birthday party we went all out, and rented a reception room at a restaurant and invited all of his family and close friends. Since everything else was done big, I decided to go big with my cake as well. I decided to make my first two-tiered cake. In this case, I made chocolate flavored batter, and kept the cakes wrapped and refrigerated for at least 24 hours before icing them. Such a good thing to do! Anything to make the icing process easier. 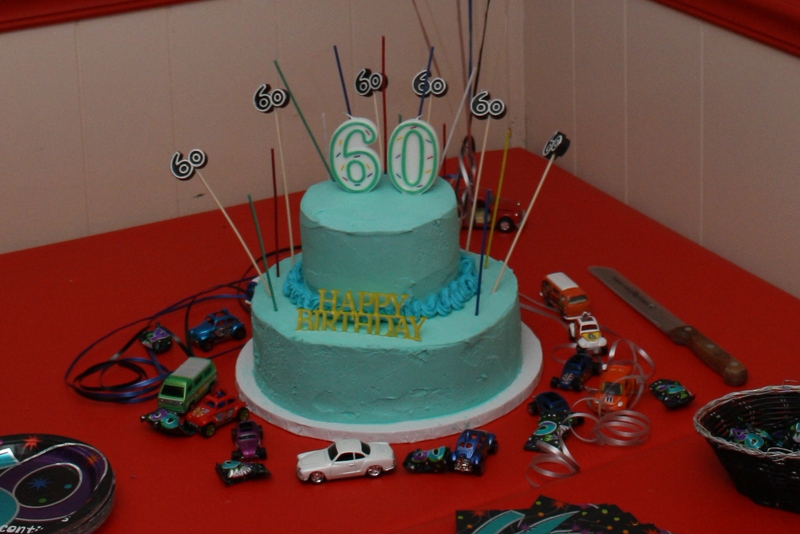 I tried getting as close as I could to a “Bahama Blue” color for the icing, since that is the color he is going to paint his old VW Bug once he’s done revamping it. And there you have it! After months of neglecting my Blog, I’m back. I’ve been working on a bunch of projects, and have not had the time to post them. But I’m taking a few minutes to get started. Lots of time to make up for! 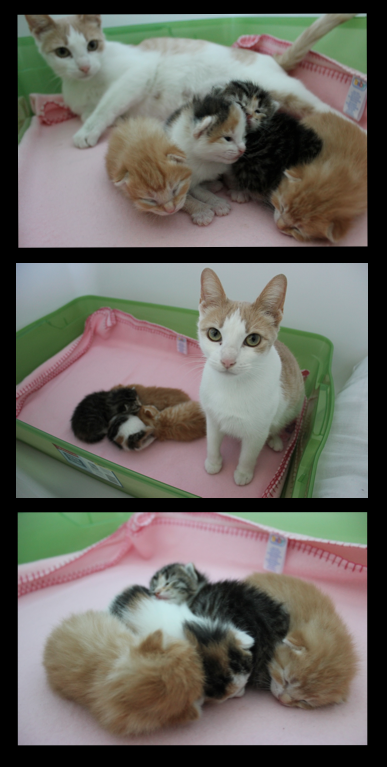 One of my projects – a 9 week project to be exact – was helping raise a litter of four kittens along with their mother. Volunteering for the SPCA has been a lot of fun, and fostering a family of cats was the funnest part. Meet Tori (“Mama”), Toby and Tony (orange tabby twins), Tibby (calico), and Tabby (the tabby). They are all now in loving homes, and will make families as happy as Abby has made us. I’ll miss you little guys! You too Tori!